A change of rules aimed at helping lower the housing costs of thousands of so-called "mortgage prisoners" has been proposed by the City watchdog. Some 150,000 homeowners are stuck on high interest-rate home loans with unregulated or inactive firms, and are unable to switch to a cheaper deal. The Financial Conduct Authority has proposed loosening its affordability checks for such customers. This could allow these people to switch to deals that are easier to pay. At present, they are stuck on high default rates, owing to an FCA requirement, introduced in 2014, for mortgage holders to meet strict affordability criteria when they apply for a new fixed deal. The planned changes would apply only to those in this situation who are not seeking to borrow more on their mortgage, but just want to get the cost down. Banks and building societies would still need to agree to take on these customers. "These changes should make it easier for customers to get a more affordable mortgage," said Christopher Woolard, FCA director of strategy and competition. Sarah Nield, financial services risk and regulation director at consultancy PwC, said the FCA's proposals were a "significant step in the right direction". "The rule changes would not only give lenders more freedom to switch 'mortgage prisoners' to better deals, but would help to future proof all up-to-date mortgage customers against the potential harm of being unable to switch," she added. However, Citizens Advice chief executive Gillian Guy said the FCA needed to do more research to find out why customers who were paying high rates weren't switching mortgage provider. "While the FCA drags its feet loyal mortgage customers are being penalised a staggering £1.4m every day. "The FCA must now go much further to protect these customers from paying the loyalty penalty. We want to see concrete action by the end of the year to stop loyal customers being taken advantage of," she said. 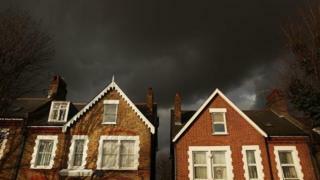 An interim report into the mortgage market, published last May by the FCA, highlighted the plight of these borrowers. These "mortgage prisoners" are unable to move to a better deal when their existing mortgages switched to the more expensive standard variable rate, even if they could meet the payments. Of the 150,000 customers affected by the issue, about 30,000 were with authorised mortgage lenders, while about 120,000 had mortgages held by non-regulated firms, which include some previous Northern Rock and Bradford & Bingley customers. Some are saddled with such high costs that they face the prospect of falling behind on repayments. Where can you afford to live? Try our housing calculator to see where you could rent or buy. This interactive content requires an internet connection and a modern browser. Do you want to buy or rent? This calculator assumes you need a deposit of at least 5% of the value of the property to get a mortgage. The average deposit for UK first-time buyers is . Your monthly payments are what you can afford to pay each month. Think about your monthly income and take off bills, council tax and living expenses. The average rent figure is for England and Wales. You have a big enough deposit and your monthly payments are high enough. The prices are based on the local market. If there are 100 properties of the right size in an area and they are placed in price order with the cheapest first, the “low-end” of the market will be the 25th property, "mid-priced" is the 50th and "high-end” will be the 75th.